I welcome spring feeling optimistic. Spring does that to you. However, I had been feeling quite pessimistic lately. My University courses come to an end this month and reality bites. I feel I am at the edge of a cliff and my time is running out. Someone is going to push me off this cliff in 3, 2, 1 weeks and I haven’t found a parachute yet. The fear is paralyzing me. Tic tock, tic tock. The agony for the future is eating my soul. I see no escape. The fear of failing, of realizing that everything has been a dream and nothing more. Riding the tube a few nights ago, on my way to a wig party, I was looking at myself on the window glass. I could hardly recognize the girl with the short, red hair, with bangs (that was my wig) and with a heavy layer of eyeliner in her eyes. And something magical happened. For the first time I no longer saw a financial analyst. I saw a food writer living in London. Not sure if it was the “new haircut” or the fact that maybe I have come to embrace my new identity but during these past few months I have changed. The funniest thing was the interviews. As of January, when I started writing for Love Your Larder, I have met and interviewed quite a few people. In retrospect, I guess it must have been fun to watch me stumbling, trying to fit into a short sentence the complexities of my identity during my period of liminality: “Um…I am a student now…I used to work in Finance…but now I study Anthropology of Food...and I write…well, for food…um…and I have a blog!…and I am writing a weekly article for Love Your Larder…and I want to become a food writer…this is where I see myself…um”. You can imagine the confused looks on people’s faces. But today I though it’s been too long, I do write about food so that technically does make me a food writer. So, for the first time I very proudly started saying: “I am a food writer and I am writing an article about… do you mind if I ask you a few questions?“. Aha! 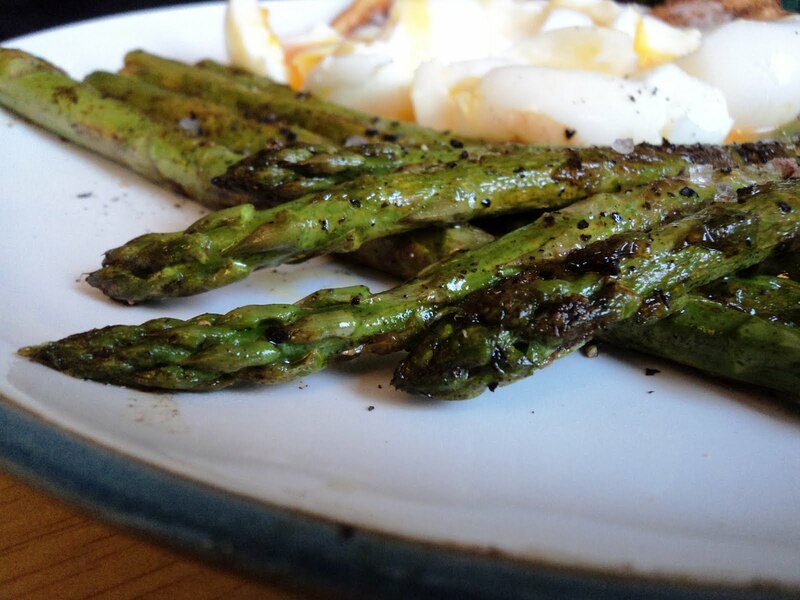 Celebrating my own personal victory and to properly welcome spring, I bought a large bunch of asparagus. We divided them with Mr N. He prepared a delicious breakfast with boiled eggs, toast and lemon-brown butter asparagus and I made a salmon tray bake for dinner. Tray-bakes are lots of fun. They have no structure and no rules. Plus, they require very little effort. That is what makes them the perfect dish if you are feeling experimental and restless and if you hate following recipes. Chopping and placing everything in the deep roasting tray, using many different ingredients together, mixing everything with your fingers, feeling the different textures and looking at the bright pink, red, green, yellow colours is exactly what I need to make me believe that everything will be all right. I am a food writer after all! This recipe is extremely simple, inspired by Jamie Oliver: Tray. 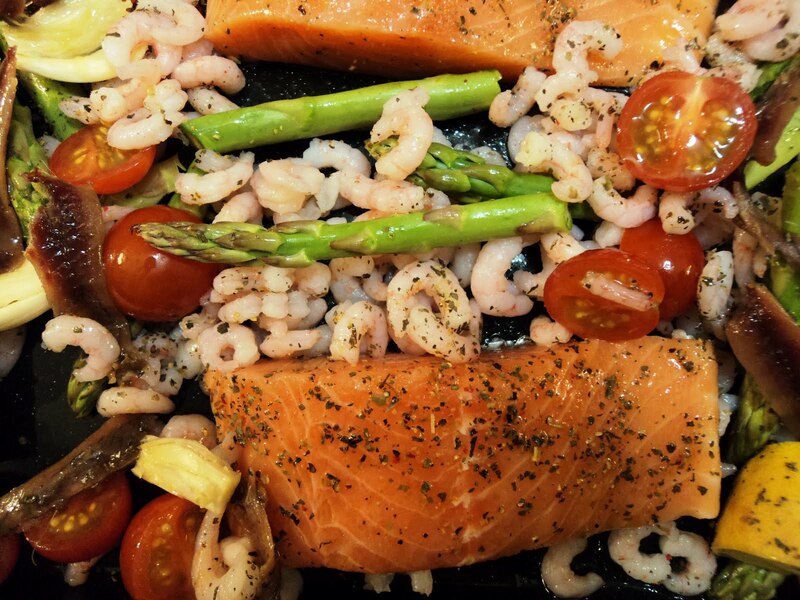 Salmon, fresh chili, asparagus, cherry tomatoes, garlic, anchovies, lemon, olive oil, basil, salt, pepper, bacon, prawns. Grill until salmon is cooked through and everything is nice and crispy, around 10-15 minutes. “Deliciously springy”. Sipping iced coffee and thinking of my friend I’s invitation for ice cream, I am thinking that maybe I do not need a parachute? What I need is to enjoy the free fall and the parachute will eventually come? Yeah, I am still not at all sure about that. So for now, let’s focus on which ice cream flavour to choose.